Bronze is beautiful, distinguishable and durable; perfect for an outdoor setting. This material features many qualities that allow the pieces to last for centuries. This bear statue is the perfect conversation piece. The statue features realistic details in the face, fur and claws that bring this bear to life in your landscape. We also have other standing bears that portray a less aggressive stance, if that is your preference. 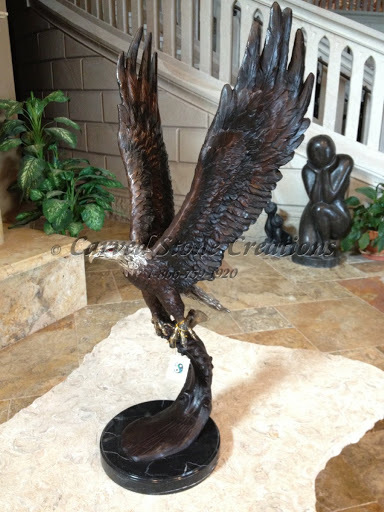 This statue depicts an eagle about to take off in flight. The use of bronze material in this statue allows for intricate details in the talons and feathers. Click the photo to see the exquisite details that make this statue truly come alive. These kids lounging on a tree branch is a unique addition to any landscape. The children look quite realistic. 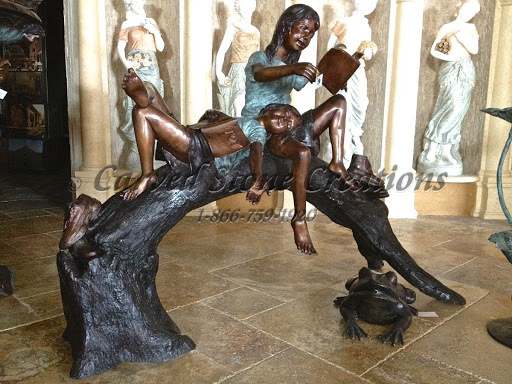 Click the photo to check out the details on this whimsical statue! This realistic sea life scene shows the gorgeous colors/patinas that can be produced on a bronze sculpture. Click the photo below to see a family of sea turtles lazily swimming amongst brilliantly colored tropical fish.